Who says GM can't make small(ish) cars? Perhaps today's bankruptcy filing is divine retribution for ever producing this car. Click to enlarge. Seriously, you have to read this ad copy: "It's the Buick of small cars that's especially big on pleasure." Billy Durant's second biggest mistake was to allow his marketeers and dealers to talk him into extending his "car for every purpose and purse" mantra into applying to *each of his brands*. Thus every platform had to be engineered in multiple essentially-identical flavors. Buick, his affordable-luxury brand, had to have a version of the Chevy Nova platform as its "small car". Lots more costs, dealers competing with each other on price for the same sales, very little more volume. Oy, what a screwup that was. Yes, it always seemed crazy to have 3-4 cars with different names that were simply variations of eachother. It's obvious why that won't work now, but how did it work for so many years? It seems like the concept should have failed from the beginning. Maybe it was just lack of competition. I learned to drive at the old Southwestern High driving range in a brand new Buick Apollo. It was a great car - though it was small, don't forget it had a V-8. The problem seemed to be our love for performance over economy, as well as too many identical cars made by different GM companies. 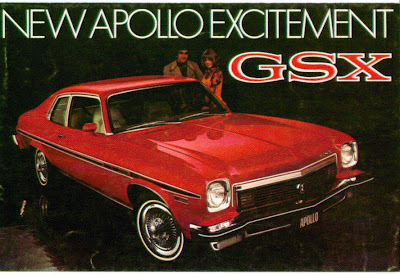 The Nova, Apollo, Omega, Ventura were all the same cars. How can you succeed when you are your own competition? 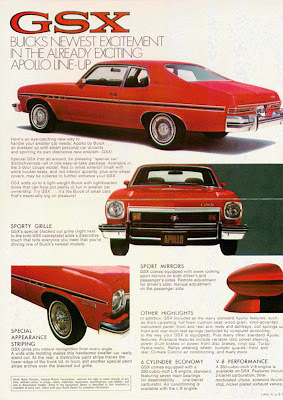 Actually the Apollo wasn't a bad little car and the cost of adapting a Nova was indeed minimal. The idea of variations is valid. It's just that under the Roger Smith days, the variations became so minimal as to be almost nonexistent. The classic example is the J-Body compact, including the Cimarron by Cadillac. (Note how they avoided directly calling it a Cadillac). My first car was a 1971 Pontiac Venture 350 V-8...there was always something going wrong with it and the reason I drive a Toyota today. There's a sweet black Apollo for sale on Davison Road in Burton. Snap it up before it's too late. This is a unique looking car. They didn't have the portholes on the Chevy Nova. The regular Buick Apollo also had the 350 emblem above the rectangular side indicator lights on both front ends, in shiny big silver numbers. Optional chrome around the interior outside windows and bottom of the car made it more flashy. Side moldings also enhanced the look of the car and protecting it from dents. Just a better looking Chevrolet Nova if it's okay to say. In answer to Nova62. If you like the look of the 1973 to 1974 Nova's I recommend you buy that GSX Buick Apollo. They are extremely rare. Have you seen one on the street lately? The parts are easy to come buy since most are interchangeable with the Nova parts and some manufacturers are probably making replacement parts for those years I'm sure. Since you like the Nova cars I'm assuming, you probably wouldn't mind someone mistaking your car for a fancy looking upgraded Nova. For the really expert car enthusiasts, they would appreciate the look and uniqueness and rarity of such a sporty Buick Apollo GSX. If it is a v8 engine, even better. 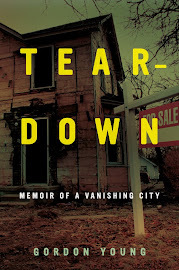 Buy it if you have the money to do so and are not currently in financial difficulties. Those people complaining about this particular car above don't know what they are talking about. Sure they had mechanical problems...but so did all American cars up until the early 2000s. For a collector, there should be no expense in fixing up such a unique classic. I learned to drive in a white 1986 to 1987 Ford Taures. An extremely underpowered 4 to possibly 6 cylinder car. It could hardly pull five people inside and I couldn't even feel the freaking road through the steering wheel. I thought I was driving a huge underpowered van conversion. This is just my opinion. Your choice. Take this car to a Nova or Chevrolet event and it will attract attention...especially the portholes and the 350 emblem if it is in that engine compartment. A babe magnet if there ever was one. Buy it if you can afford it.